RUSH: Here’s Roger in West Plains, Missouri. Roger, I’m glad you called. Great to have you on the program. Hello. CALLER: Rush, to start off with, I’m a big fan of you, but I do owe you an apology. In 2007 and 2008, I was an Obama zombie, and I said some very bad things about you, and I’d like to apologize for that. RUSH: Well, I didn’t even know that you said them. CALLER: (chuckles) Well, I said them to just about anybody that would listen to me, and I have felt very bad about it since I came back to my senses. I can honestly say that Obama was the first Democrat president I had ever voted for, and I did it because I didn’t like McCain, you know? That’s pretty much why I did it. RUSH: Well, now, but there’s gotta be more to it than that. Otherwise you wouldn’ta had such rotten things to say about me. I mean, you had to be under the Obama spell to some extent. RUSH: Well, how did it happen? What in the world…? Set aside the fact that you didn’t support McCain. We all understand that, but Obama’s the first Democrat you ever voted for? It has to be more than you just didn’t like McCain. What was it? CALLER: It’s honestly the things he said. I believed what he said. I believed that he could help the country. 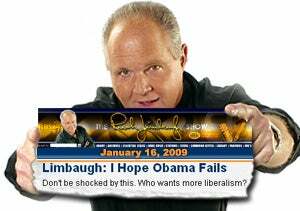 RUSH: You believed he was gonna end bipartisanship? He was gonna make the world love us again? He was gonna create jobs and going to put America back to work? You bought into all of that? CALLER: I honestly bought into all of that. I bought into the fact that we’d have a black president would end racism. RUSH: Okay, now, the next question I’m gonna ask, I’m not trying to put you on the spot. There’s no wrong answer. I’m not trying to set you up. I’m genuinely curious. Were you listening to me during that period of time, during the campaign of 2008? RUSH: What is it that brought you back? CALLER: Um. (chuckles) Honestly, Obama. The things that he’s not done, the things that he said he was gonna do, the fact that we’re almost $17 trillion in debt. RUSH: Now, here’s another question. You said you’re an intelligent guy, and I believe you. Does it not bother you how easily you got hoodwinked? RUSH: Because I’m telling you, it was easy for me to predict what was gonna happen, and I predicted it, and it was easy for me to tell you, “By the way, this isn’t gonna end racism. It’s only gonna make it worse. Because any criticism of him is gonna be said to be racist. It’s gonna make it worse. It isn’t gonna solve anything.” You thought I was a racist saying that. Now you’ve obviously come to see that that was correct. The interesting thing with you is, by your own admission, you’re a smart guy, and it worked on you. All of that emotional reaching out, that emotional “hope and change,” worked on you, and it lasted for three or four years until you saw the light. CALLER: Yes, it did. My entire family, nobody voted for him. Everybody has criticized me ever since for voting for him that first time, and I defended him to my family. I said bad things to my own mother because she didn’t like him! RUSH: Look, I know so many people like you. You’re one of the few to admit it, really, but I’m glad that you called. You don’t need to apologize. I understand it. (interruption) Well, of course I forgive him. I’m a forgiving guy. Let me ask you before you go, Roger. Did you vote for Obama in 2012? CALLER: I’ve actually stopped watching the lame-stream media. I don’t watch any of it anymore. RUSH: Well, you know, I’m not trying to guilt you, but you have to be blamed partially for the state the country’s in. You helped make it happen. CALLER: Yes, I know I did. CALLER: I know I did, and I have been trying to atone for it ever since. RUSH: Well, this is a first step, calling here. It’s a big move that you’ve made here, and I can’t applaud you enough. I’m happy to have you back in the fold. That’s Roger in West Plains, Missouri.